Sunday, May 14, 2012, part B: (with apologies to the late Paul Harvey) You've heard the headline: how I was Lemon Squeezed ... now here's the rest of the story. That single moment on the trail, just north of the Lemon Squeeze crevice, where the trail goes vertical for 8 feet, was a watershed. In horizontal trail length it was essentially zero distance covered. The time taken to travel that distance was half a minute. But the repercussions have lasted for days. "10 = Use of hands required for extended periods of climbing, footing precarious, and leaping may be required — not recommended for those with fear of heights and not in good physical condition. 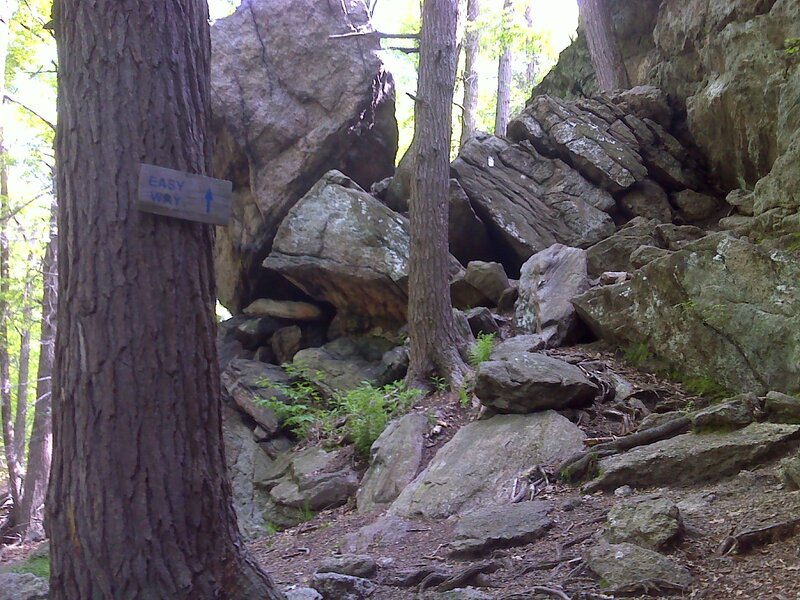 Shorter hikers may be at a disadvantage"
No part of New York is given a rating higher than 5. FIVE! What have I gotten myself into??? A few days ago I passed through a stretch of trail, just after entering New York, that was slow and strenuous and really wore me down. I don't think I've fully recovered from that yet - physically. And now comes this psychological blow. If this a 5, how in the world am I going to make it through sections rated 10? It turns out that Monday (May 15th), a day with serious Spiritual significance for me (won't go into any detail here) was going to be showery, and Tuesday was forecast to be even wetter. So I decided to use these days (and Wednesday as well) to go back home and take care of business, do laundry and ... yes, reassess this whole thing. I'll have more to say about the consequences of reaching this watershed in a couple of upcoming zero-day posts. When you come to a watershed, you reach a point where the landscape turns in a different direction, and where gravity takes you to an entirely new destination. What is this new destination? I have to figure that out. Meanwhile, there's also 'The rest of the Story' in a more mundane sense - the story of Sunday's hike - specifically the part north of Island Pond Mountain. I've deliberately separated Sunday's hike into two posts, mostly because the first post took on its own direction (post-watershed) but the second part of the hike, though it came after the first, took me temporarily back onto the familiar old (psychological) ground. Yes, the trail got easy again - but not at first. 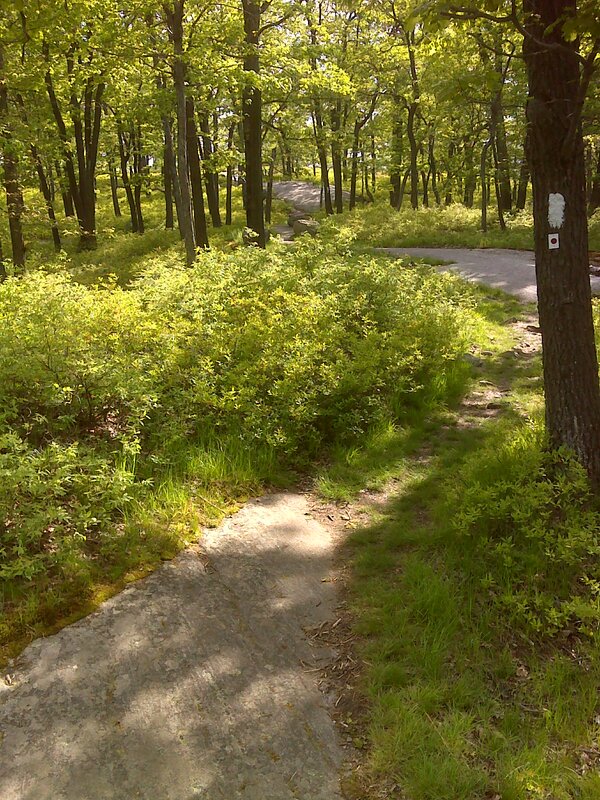 Describing the trail northbound from the park-like summit of Island Pond Mountain: there are a series of little ups and downs, some steep and some rocky, that slow you down as you pass through hemlock and beech forests. Then you ascend again and reach the high ground on Fingerboard Mountain. There the setting is once again wonderfully park-like, with no undergrowth, only big trees. 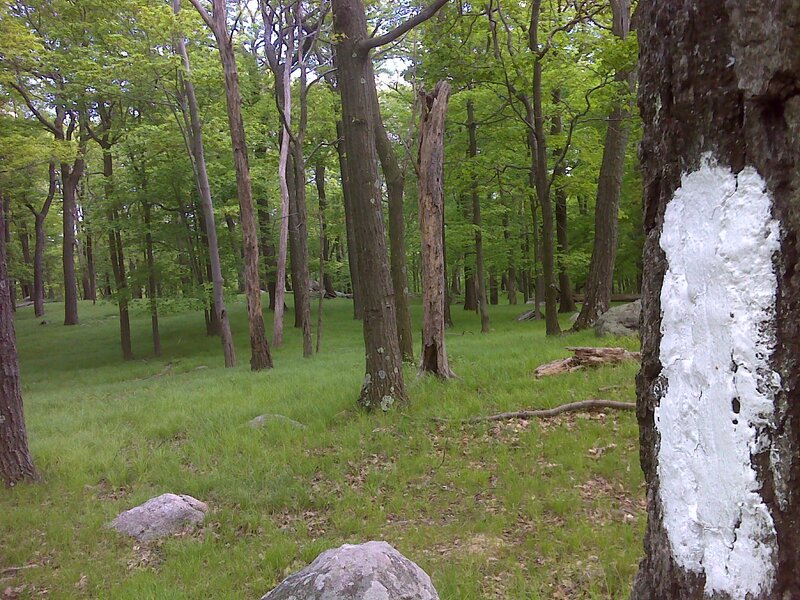 It looks like deer over-browsing may be killing off all new tree seedlings and other understory growth. If so, then this pretty setting is actually an example of a forest in distress caused by human interference - killing off the wolves has allowed the deer population to explode. And deer are eating away the understory. 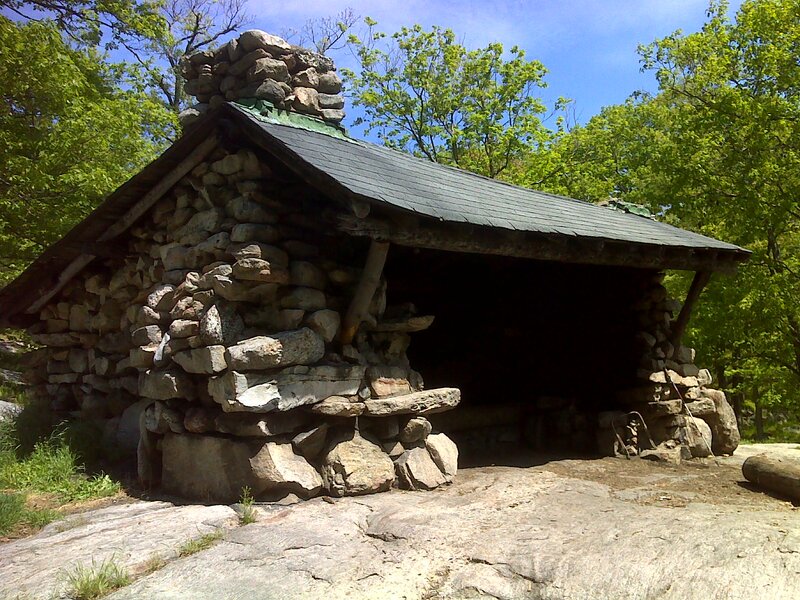 Near the summit of Fingerboard Mountain you find Fingerboard Shelter - a wonderfully rustic structure built in 1928 that looks its age. I wish I had taken a picture of some of the woodwork, including the heavily worn floor planks. Fingerboard Mountain also contains lots of 'bedrock boulevard' - places where the trail follows ribbons or slabs of exposed glacier-smoothed rock. Next you cross Arden Valley Road and then the trail gets easy. The descent to and ascent from Seven Lakes Road is gentle, gradual and mostly rock free. I made good time on this stretch and so was able to reach William Brien Shelter - another rustic old stone lean-to, but this one with more of the classic (WPA style) appearance that appears to have been popular for stone buildings in this area -- massive boulders incorporated into a wide base, with the walls then tapering significantly with height. The William Brien Shelter was my turn-around point for the day. 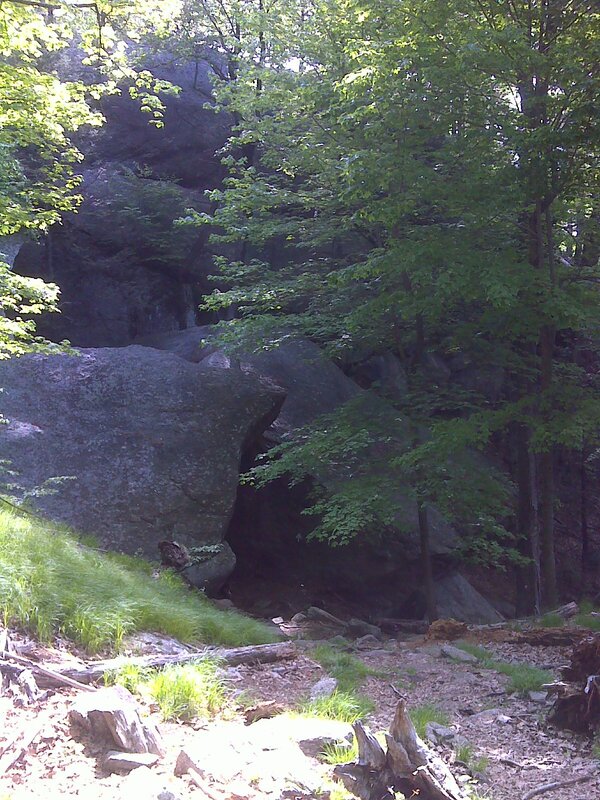 I enjoyed Fingerboard Mountain and the bedrock walkways all over again; and I looked forward to revisiting the Lemon Squeezer, and to descending the 8 foot wall above it. In this case it took a short jump, or controlled fall, to get down -- and this is a case of 'The shorter they are, the harder they fall'. I made enough miles today (19) to compensate for the short day yesterday. But with zero days ahead, and with The White Mountains beginning to appear on my horizon, one nineteen mile day isn't going to make much difference. That was in the old watershed, where the miles came easy and everything was cool breezes and light. The new watershed seems to have a dark cloud over it at the moment, full of shadow, taking me to strange and secret places ... more on that in coming posts. Below is the track of the entire hike, parts A and B, taken Sunday. The title is a link that takes you to more photos and data. 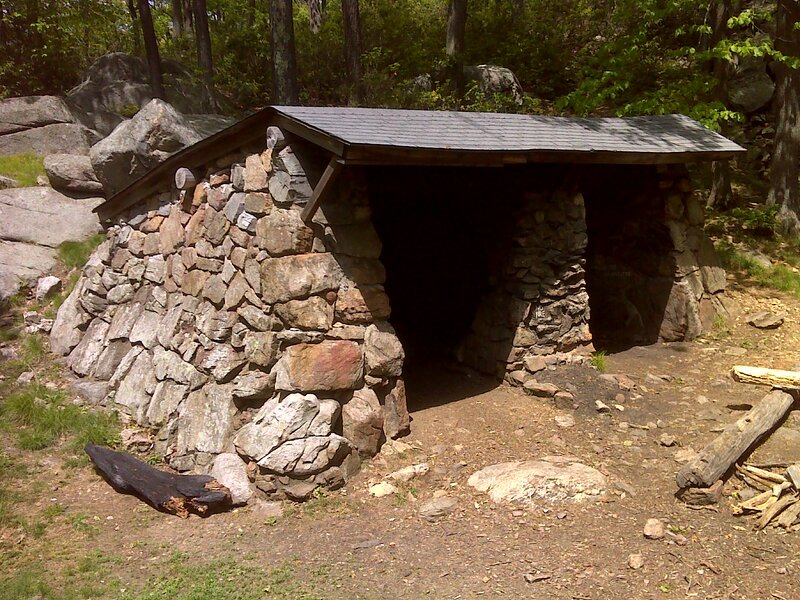 Does the William Brien Shelter resemble a tomb to you? :B Your milage is is KILLER!! Great work, PJ.